UK, 1984, 90 minutes, Colour. Rupert Everett, Cary Elwes, Colin Firth, Anna Massey. 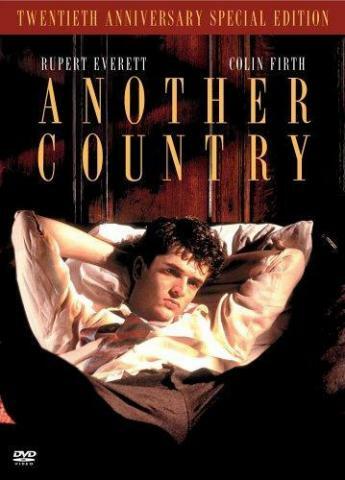 Another Country is based on the play by Julian Mitchell. It is a fictionalised account of the education of British defector Guy Burgess. This has been the subject of a number of films, both fact and fiction, including Burgess, Philby and Mc Lean, Blunt. The film was directed by Marek Kanievska (Less Than Zero). It has a very strong cast led by Rupert Everett as Guy Bennett, the fictionalised Burgess, as well as a very good performance by Colin Firth as a leftist-thinking student. The film re-creates the public school of the '30s with all its manners and mannerisms, the old school tie which was to form the basis for English business, government, civil service. The film also highlights the homosexuality of Burgess, situating it in the moral context of the public school and the avoidance of scandals. It also highlights Burgess's independence, wanting to be outstanding - yet frustrated in his ambitions. The film is thoughtful as well as critical of the British public school system. 1. English drama? Education? The background to the civil service, intelligence and espionage? The story of Guy Burgess? 2. British public schools in the '30s, visuals, beauty, cloistered education, the playing fields, affluent world? Costumes and decor? Hymns, score? 3. The original play, opened out - characters, situations, speeches? 4. The title and the reference to This England, England and its past, what England? Loyalty and betrayal? The Soviet Union? 5. The basis of the film on Guy Burgess and the reality of his career, betrayal? 6. The framework of the film: Burgess in Moscow, aged, the interview, his attitudes, telling his story, regrets about Tommy? No regrets about England - except cricket? 7. The picture of the English public schools: the traditions, the absence of staff, the prefects, the gods, the language of authority and power, discipline? Behaviour, morals? Playing the game, playing games? The image for the future? 8. Guy Burgess and his background: his mother and her visit, the meal, the car, their wealth, her husband and his heart attack, the second marriage? Her influence on her son? 9. Burgess as spoilt and wilful, his ideas and hopes, wanting to become a god? His philosophy, drinking, relationship with the other prefects? His friendship with Tommy? Their talk, arguing, frank statement of opinion, advice? His homosexuality? The discovery? His expression of it, the freedom of acknowledgment? His plea for understanding? The fascination of Harcourt, the cricket match, giving people out? The meal, the date - the frank and romantic talk? In love? His return to his room, the discussions with Judd? The notes to Harcourt? The meeting and the vote? His being caught, using blackmail against the prefects? His enduring the beating for Harcourt? The final talk with Tommy, plea for equality and ignoring of sexual preference? The finale? 10. Tommy: his leftist thinking, reading Marx, his cynical attitudes, using logic, criticising hypocrisies, mocking the school? Cricket, knowing that he was the school joke? The dilemma about his becoming a prefect, helping Guy? His prejudices about homosexuality? His advice, his confrontations? The information about his death in Spain? 11. Harcourt, the ordinary student, playing cricket, the meal with Guy, their talk, his awkwardness, listening to him, puppy love, the meeting in the boat? The information about his later career and marriage, guy as the godfather to his child? 12. The prefects, politics, the staff, manoeuvres, pressures and meetings? Bennett's blackmail, the beatings? The later information about their careers? 13. The theme of homosexuality: the incident, the boy hanging himself, the prefect's handling of the situation, scandal and reputation? 14. The background of class, privilege, government, the old school tie, the repercussions for World War Two, intelligence in the aftermath? Bennett and his anger, despising the school, his self-indulgence, betrayal? 15. The information about the later careers of the chief protagonists of the story?